Being on a jet ski can be one of the most enjoyable things to do on the water. 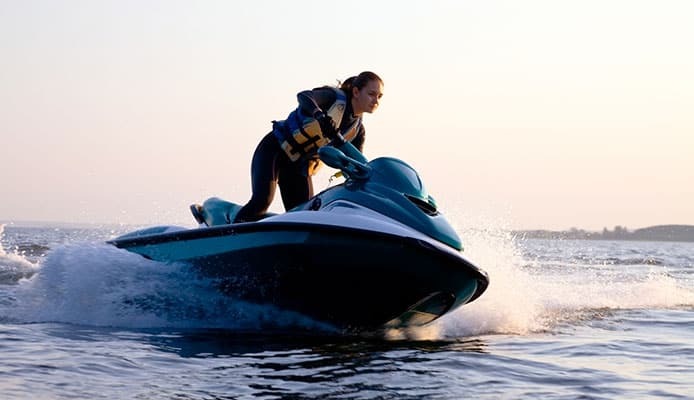 Traveling that fast over the waves though means that you need a life jacket that is going to be able to cope with a heavy impact, which is why getting the best life jacket for jet skis is vital. 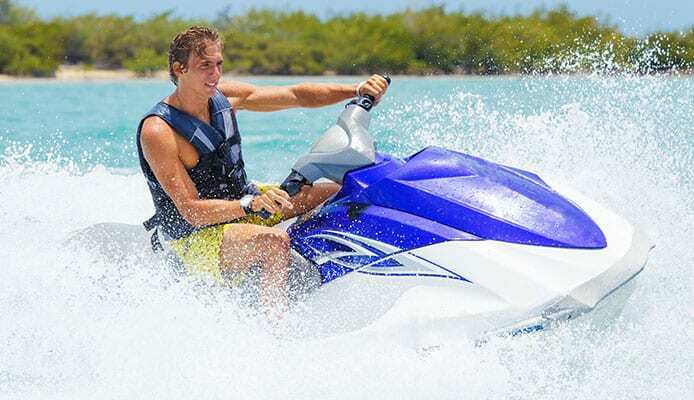 In order to ensure you’re getting the best jet ski life jackets, we have developed a buying guide and have completed life jacket for jet skis reviews to give you all the information you need. Once you’ve finished reading this guide, you’ll know exactly what you need. With jet skiing life jackets, the best material that you can have is neoprene due to the high amount of strength it has to go with its water-resistant capabilities. It also has a natural level of stretch too which adds to its comfort. This is a vest that has been specifically made for male users and has a great fit. That is helped by the two large buckles that it has and also the durable zip down the middle of the jacket. This is a great vest and one that is highly rated. 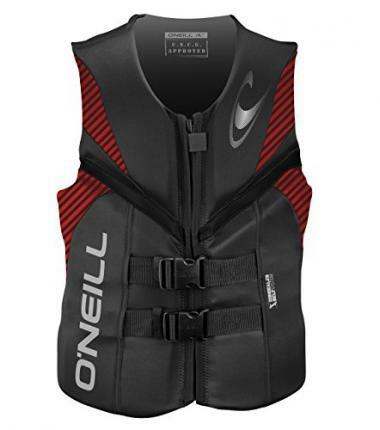 O’Neill are experts at making jet ski life vests and this product is a great example of that. It has a very stylish design and is available in a wide range of different colors to ensure that you are going to look stylish when out on the water. It is USCG approved and has a minimal bulk design to allow for a full range of mobility. It has a durable coated polyester shell and is light to ensure a comfortable fitting for the whole day while you’re out on the water. 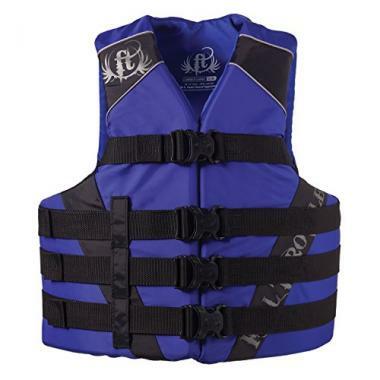 This is one of the top rated jet ski life jackets on the market and one that has a long list of great reviews. It’s available in either blue or red depending on your preference and has three straps across the chest to give you the support you need. It’s available in other universal and oversized sizes and will be comfortable with the high level of adjustability that it has. It is made out of durable nylon material and is open-sided to ensure your movement isn’t restricted. 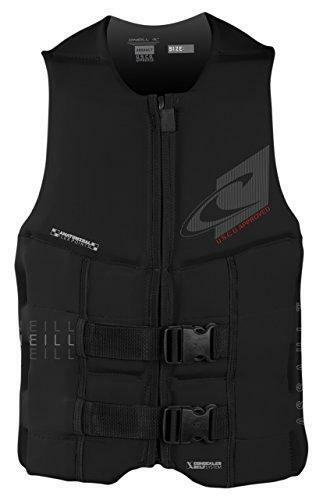 This jet ski vest from Stearns not only performs to a very high standard but it also looks great too. It is able to give you a very high level of security with the four straps that it has across the chest, to ensure a close but comfortable fit. It is coast guard approved and perfect for all types of water sports such as wakeboarding and tubing, as well as being ideal for a jet ski. Its open-sided design won’t restrict your arms, giving you a full level of maneuverability. In terms of life jackets for jet skiing, you need a product that is able to cope with high impacts and that’s exactly what this jacket can do. It is coast guard approved to give you reassurance that you will be getting a quality product. It has a 1.5mm neoprene outer which is going to be able to give you a high amount of comfort but also a great level of durability too. It has a zip closure with two straps that are able to go across the chest to keep you secure. This is another life vest that is going to be ideal for those looking for a product that has an extra bit of style. It’s a good-looking jacket that comes in a range of different colors and designs, allowing you to look good when you are out on the water. It’s made of a mix of mesh, neoprene and polyester to give you the best of all worlds when it comes to materials. It has a segmented foam core that is going to allow a lot of flexibility. The jacket is very secure with two large buckles and a zipper. This is another jacket that has been made specifically with men in mind and has a heavily segmented design to give you the highest level of flexibility possible. It is also made from neoprene too, giving you that strength and comfort. It is approved by the US Coast Guard to give you the assurance that you are getting a quality product and it has a two-buckle closure and a zip for added security. This is another jacket that is high-rated and with a stylish design. Water skiing vests have to meet certain standards in order to be compliant and all the jackets in this list are able to perform to those standards, including this great jacket from Full Throttle. It comes in red and blue and they both look great. The jacket has a very secure fit with four different straps that will enable to have a customized fit so that it is secure as possible. It’s made from durable nylon and is lightweight too. It will be easy to wear for a full day due to how comfortable it is. 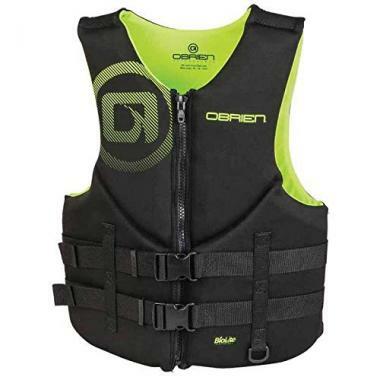 This is a life vest with a very open design that is going to allow for a wide range of movement. That not only makes it ideal for being on a jet ski but it also means that it is perfect for every other water sport too. To add to that mobility, it also has flex points on the jacket that are going to allow your body to move freely. The foam that it uses is extremely light to be able to give you a high level of comfort, even when wearing the jacket for a full day. 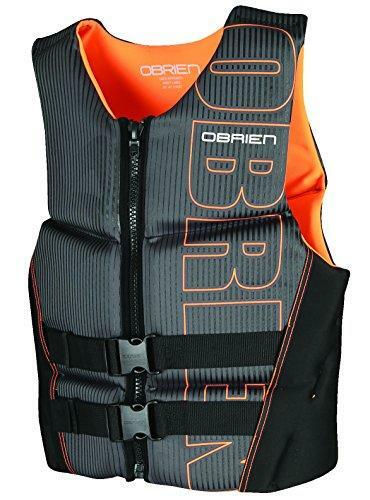 This is another great jet ski PFD, this time from O’Brien who have created this highly rated product. The arms holes are extremely wide open, making this an ideal life jacket for those that don’t want their movement restricted in any way. It has a neoprene outer to give you the most comfortable fit possible and it will securely close with the two large buckles that it has and also the durable front zip. It has a stylish design and is available in a few great colors. The material is going to play an important part in your buying decision as there are a few different types out there. While all the products that we have looked at here are high in quality, there are differences between the materials that they use on the outer. Nylon and polyester are common materials as they are both strong, lightweight and can be made waterproof too. The best material used is neoprene which has those qualities but at a higher level. Neoprene also has a natural amount of stretch to it and therefore it is going to be more comfortable. It goes without saying that getting the right size is going to be important. You want to make sure that you are getting the right product for you and different companies sell their sizes in a few different ways, with some having a universal fit and others having specific size options. If you’re looking for infant life jackets or life jackets for kids then it is best to click through those links as the products that we have looked at here are not going to be ideal. It’s important to make sure that you get the measurements done correctly so that you aren’t left with a life jacket that is dangerously too big or too small. Getting the wrong fit on your life jacket is not only going to be uncomfortable but it will also be dangerous. That’s especially the case on a jet ski as you will be traveling at high speed and therefore the impact that you have is going to be higher. It’s important to get the right fit and that’s why there are men and womens life jackets to ensure that everyone gets a great fit. The amount of straps and the adjustability on them is important to ensure that you are going to get a comfortable fit. 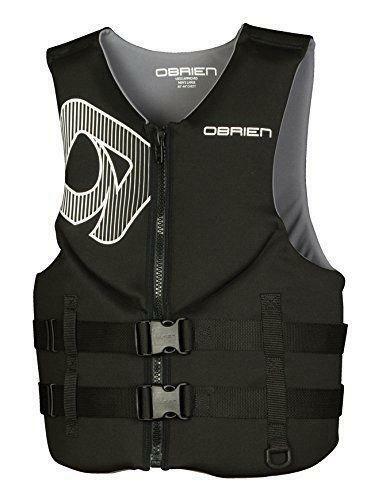 You also want to make sure that you are getting a life jacket that is going to be able to give you the right amount of mobility that you need. All of these life jackets have open arms, but some are wider than others. This is important when you are jet skiing as you are able to have a full range of motion. Life jackets are there to help you in an emergency and will possibly save your life. With such a product, you never want to take any chances and getting the best possible life jacket is important. That means getting on that has been approved by the US Coast Guard. 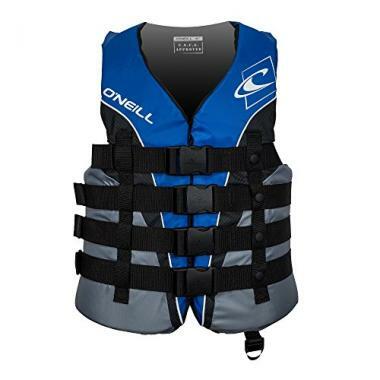 If you need a life jacket for water sports then it is going to require a greater level of build quality than other jackets. It has to cope with a higher range of impacts and can’t come loose when you have a high-speed impact with the water. A USCG approved product will be able to give you peace of mind that you are getting a quality product. Q: What Is The Difference Between A Regular Life Vest And Jet Ski Life Vest? A: You would be able to use a jet ski life vest as a regular life jacket but you wouldn’t always be able to do it the other way around. Part of the reason for that is due to the freedom of movement required and also the high impact that it has to cope with. Whether it is needing a life jacket for kayaking, a sailing life jacket or even a dog life jacket, it’s always important to get a product that is going to match the situation that you are in. 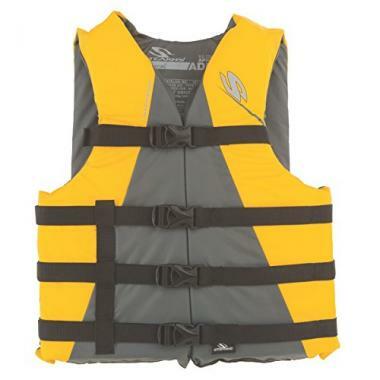 These types of life jacket are Type III life jackets which means they are going to be a flotation aid. 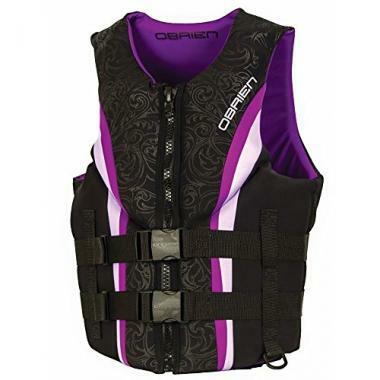 There are other types of life jacket, such as Type I and Type II that have a lot more padding and don’t give you the same range of mobility. These jackets are the types used in an emergency as they will keep your mouth above the water, even when you’re unconscious. Q: How To Clean A Jet Ski Life Vest? A: A jet ski life vest can get dirty over time, especially when saltwater dries on the material and leaves behind a residue. Thankfully cleaning them is a relatively simple process and one that doesn’t require too much effort. Most life jackets are going to be able to be cleaned with mild soap and a damp cloth. The material will be highly water resistant and therefore any stains won’t stick too much and won’t be difficult to wipe off, keeping your life jacket looking new and stylish. Q: Are Jet Ski Live Vests Safe? A: The life vest is an important part of water safety but there are a few key things that you need to know about ski life vests. Firstly, they are going to be safe and well-tested if they have been approved by the US Coast Guard and you have to look out for that. The likes of inflatable life jackets and fishing life jackets, for example, are going to have different needs and therefore you want to make sure that you are getting a jacket that is going to match your circumstances. These types of jackets aren’t going to be the type that you would find on a large ship. The reason for that is due to them being a lot bulkier and being able to cope with rougher water conditions. Jet ski life jackets don’t have any support behind the head as they have to have a much higher level of mobility. This doesn’t make jet ski vests unsafe but they don’t offer the same level of support as other life jackets. These life jackets though are going to be able to deal with high impacts and are ideal for the type of situation that you are going to be in. As most people are aware, the water has to be respected at all times. This is going to be especially important when you are traveling over it at high speeds. That makes the need to have a high-quality life jacket essential to make sure you’re safe. The most important aspect is going to be about getting the right size and fit that is going to suit your needs. 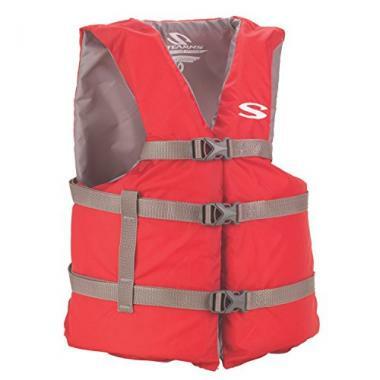 Having a life jacket that is too big or not able to be fastened properly would be dangerous. When you fit the water you have to be confident that it is going to stay firmly in place and you are going to get the protection that you need. Once you know exactly what size you need, you will be able to choose the color and design that most suits yourself. Hopefully this guide has given you all the information that you need in order to choose the best life jacket for you. Once you have, you’ll be able to head out there on your jet ski with peace of mind that you are going to be protected.